It's been "chalk" all the way, but I'm expecting The First Fifteen Lives of Harry August to run away wit h it. Maybe that's just the pessimist in me. Rob wrote: "It's been "chalk" all the way, but I'm expecting The First Fifteen Lives of Harry August to run away wit h it. Yeah, I hope I am wrong, but I think for the second year running, the book I am least interested in reading (of all the March Madness books) will win. I was secretly hoping that The First Fifteen would loose early on as I wanted to read it now. Except for this round of course. Theft of Swords all the way! I've read both but Theft of Swords is a book I recommend to others. Also, if you're an audio book person, the narration is outstanding. I feel like if Theft of Swords wins, Rob will be running around his house like Jonathan E at the end of Rollerball. I was really pulling for The Martian Chronicles. Eh, oh well. Dara wrote: "I was really pulling for The Martian Chronicles. Eh, oh well." Something I've found in my experience running polls in another group is that with many books is that sometimes people just don't aren't interested or won't vote for an older book (obviously not always the case). Either because they've read it already, or just don't like older writing styles. I think at this point of trying for how many years that Tom just needs to pick it as a dictator pick because if you put it in a poll against something shiny & new, it's not going to win. Wow, the books I vote for are still winning, in a reversal of last year's March Madness! The First Fifteen Lives book sounds really interesting to me, but at this point I'll be happy with either contestant winning. Trike wrote: "I feel like if Theft of Swords wins, Rob will be running around his house like Jonathan E at the end of Rollerball. At this point because I've been pushing for the group to read it for so long, I feel like there will be a huge letdown to some people because of all the hype. That book is far from my favorite he's written, but some of the latter books were, and that's the best starting point in my opinion. But none of that matters because I've already resigned myself to the fact that it's not going to win.. I will say normally I skip rereads (which has been all 3 books for me this year) but if Theft actually wins I plan to reread it since I've read about 8 more Ryria books since then. This is tough, I now want to read both. In a straight comparison, I would be voting for The First Fifteen Lives of Harry August, but I think my weakness for supporting the long-suffering underdog may force me to vote for Theft of Swords. That seems a bit extreme.. I really liked the book, or I wouldn't keep recommending it. Nor would I be willing to waste my time rereading it with the group if it won. Especially knowing that once I start I'll be tempted to reread the rest. Although my recollection is the first 2 stories are stand-alone enough that I can probably just stop there. I just think it's a series that improves a lot in terms of both writing and story. Aaron wrote: "This is tough, I now want to read both. In a straight comparison, I would be voting for The First Fifteen Lives of Harry August, but I think my weakness for supporting the long-suff..."
As for the final matchup, First Fifteen Lives of Harry August is a good book, but I'm fine with our long serving helpful Mod having his way. One vote for Theft of Swords coming up. I've forgotten. Was our diabolical plan to give Rob the win he's been pushing for or to get him to the finals and then dash his hopes? In all seriousness, super excited for either pick. I'm quoting this from another the thread from round 1. I'm just impressed with how many of Tom's picks have come true. Will he continue his streak through the finals? And dash Rob's hopes and dreams in the process? Only time will tell. Tune in next week for another thrilling episode of "TOM CONTROLS THE WORLD" echo..echo.echo. Tom wrote: "Time to make some predictions before I get spoiled by knowing the voting trends. Laser is vindicated as First Fifteen upsets Theft in a nail biter." I've read Fifteen lives and loved it. Not read Theft or anything by that author. Will have to think about this. David wrote: "He was completely wrong about the Trail of Lightning matches at least, so my comment from the original thread holds true. :)"
Tom intentionally threw that prediction in order to sow doubt about his time-tuner powers so we wouldn’t BURN HIM AS A WITCH!!!one!! John (Nevets) wrote: "I'm quoting this from another the thread from round 1. I'm just impressed with how many of Tom's picks have come true...."
It's almost as if he's seen it all before...which life are you on Tom? Yeah, in addition to making sure both of them were on my Want to Read list, I put both on hold at my local library. (But I voted anyway. Go Theft!)" John (Taloni) wrote: "Too bad for Martian Chronicles. I shall appeal to the dictator for a pick later on! (channeling AC/DC: For those about to read, we salute you!)" Ray Bradbury was born August 22, 1920, so we can celebrate his life by reading one of his books August 2020. The question is which Bradbury book? ^ Meaning, Martian Chronicles or Fahrenheit 451? I'd still go with Martian Chronicles. And yes, he has other great works, but those are the top 2. Something Wicked is my favorite Bradbury novel. John (Taloni) wrote: "^ Meaning, Martian Chronicles or Fahrenheit 451? I'd still go with Martian Chronicles. And yes, he has other great works, but those are the top 2." I recently read Fahrenheit 451 and it exploded my brain. It was his debut novel, too. Ben wrote: "I read Fahrenheit 451 recently and found it to be a drudge. Is there something wrong with me?! O.o"
Probably not. Bradbury was a reactionary bore at times. Ben wrote: "Is there something wrong with me?! O.o"
Nah, we all like different things. That 'Bobbyverse' book won March Madness and was the most popular book we read last year, but I found it dull at best. I also like pineapple on pizza. Shrug. Every book we read has varying opinions from love to outright hate. Which is what you'd expect in such a large and varied group. I'm fine with whichever book wins. I've read Theft of Swords and loved it and will re-read it and TFFLoHA sounds cool. Ruth (tilltab) Ashworth wrote: "I also like pineapple on pizza. Shrug. " Garlic chicken and green chile pizza with Theft of Swords or TFFLoHA on the side. Mark wrote: "John (Taloni) wrote: "Too bad for Martian Chronicles. I shall appeal to the dictator for a pick later on! (channeling AC/DC: For those about to read, we salute you!)" Ray Bradbury was born August ..."
If we don't read him August of this year, we DEFINITELY should read him August 2020! Trike wrote: "I recently read Fahrenheit 451 and it exploded my brain. It was his debut novel, too." Jen wrote: "I think I'll be happy if either book wins, but I voted Theft for the Roberator! (got any of those high-fives left, Rob?)" Louie wrote: "Trike wrote: "I recently read Fahrenheit 451 and it exploded my brain. It was his debut novel, too." Have you seen/Planning on seeing the Michael B. Jordan adaptation HBO did last year? – Not even going to ask about the 1966 adaptation. Needless to say, it was very French, but I also really like Truffaut, so...."
I think I’m going to do the same as Iain and get one on audiobook and one in dead tree. Given Rob’s review of Theft’s audio, I think I’ll do that and grab FFLoHA in hard copy. Yeah, the Riyria books are excellent in audio! Theft of Swords was my "find" of the past twenty years and I've been looking for an excuse to reread it. I've given this book to so many people and everyone has fallen in love with this world and the characters. I have not read Harry August and would like to read it sometime but at this moment I just want the most people possible to join in the fun and mastery of Theft of Swords! Unbelievable plotting, the best characters in fiction, great dialogue - who am I kidding? I am probably going to reread the whole series again anyway whether it wins or loses. If you've already voted in S&L's March Madness, Amazon Prime Video has a Sci-Fi Series Championship with voting on Twitter. 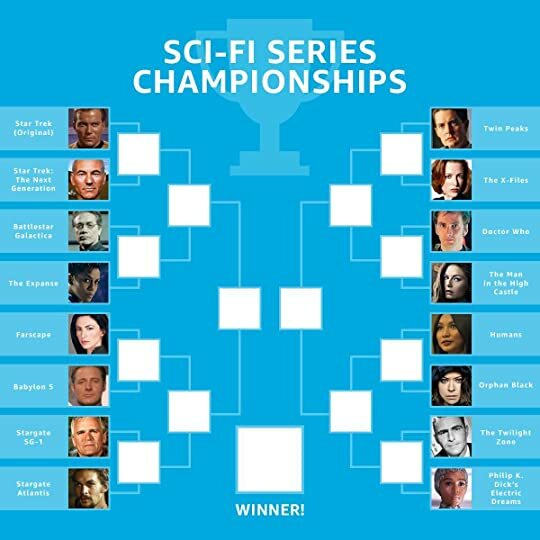 I look at those brackets and the best sci-fi series on both sides (IMHO) doesn't stand a hope in hell of getting through. Twin Peaks as Sci-Fi is a hard sell for me. It's fantasy all the way. I went and voted, was fun. Buuuuut....Twin Peaks in and Firefly not? It was a good run for it, Ray Bradbury. John (Taloni) wrote: "I went and voted, was fun. Buuuuut....Twin Peaks in and Firefly not?" They must not have the license for it. In fact I’m guessing that was part of the reasoning behind the bracket, to draw attention to all the shows they do have licensed. Still, it is a more fun way to do it then just running an ad.